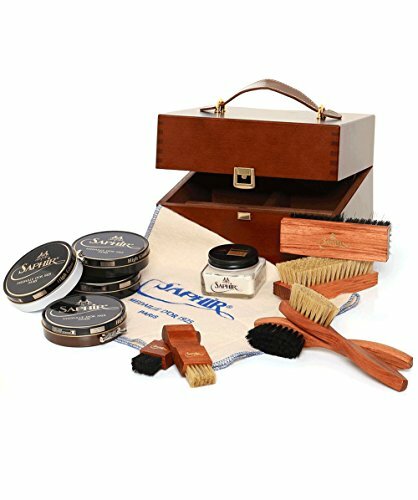 A beautifully crafted shoe valet box from the purist shoe care maker Saphir. This box which is made from a Medium Stained wooden Veneer and comes with a leather carrying handle and contains the following, 4 100ml waxes in black, medium brown, light brown, dark brown. 2 pommadier brushes, 2 polishing brushes and 2 spatula hand waxed brushes. 1 Renovateur medaille d'or and 1 cloth in cotton. If you have any questions about this product by Saphir Medaille D'or 1925, contact us by completing and submitting the form below. If you are looking for a specif part number, please include it with your message.